I didn't have much luck with Oyeyemi's most recent release, Boy, Snow, Bird, so I went into White is for Witching interested but with tempered expectations. While it definitely surpassed my BSB experience, this novel was not without its issues. As a child, Miranda Silver developed pica, a rare eating disorder that causes its victims to consume nonedible substances (for Miranda, chalk). The death of her mother when Miranda is sixteen exacerbates her condition; nothing, however, satisfies a strange hunger passed down through the women in her family. And then there’s the family house in Dover, England, converted to a bed-and-breakfast by Miranda’s father. Dover has long been known for its hostility toward outsiders. But the Silver House manifests a more conscious malice toward strangers, dispatching those visitors it despises. Enraged by the constant stream of foreign staff and guests, the house finally unleashes its most destructive power. With distinct originality and grace, and an extraordinary gift for making the fantastic believable, Helen Oyeyemi spins the politics of family and nation into a riveting and unforgettable mystery. Soooo, yeah. That blurb makes some big promises, and the book only partially follows through. Miranda's story is interesting. She's all screwed up from the loss of her mother, and rightly so. The house seems to have an even more destructive effect on her, but is it really the house or is Miranda just crazy? Signs point to both. This book is just weird. Weird-beautiful in spots and frustratingly weird in others. While I enjoyed the smattering of fairy tale elements in this story, I was less satisfied by the alternating perspectives of Miranda, her twin, the house, and one of Miranda's friends from college. There was definitely an off-kilter, menacing atmosphere in this book, but I kept looking for some deeper message or meaning to it. The blurb mentions issues of politics, family, and nation, but those things were only glimpses. The overarching story seemed to lack depth, and like Boy, Snow, Bird, I thought Oyeyemi had way too many conflicts in the air to flesh any of them out to a satisfying degree. In short, while I enjoyed bits of it, I doubt I'll pick up more of Oyeyemi's work. Ahh, I almost didn't want to read this because White is for Witching somehow became one my precious, flawless favourites (everyone has a few of those, right? ;)) But thankfully you haven't hit me too hard here. I am bit surprised to see how many people didn't enjoy the alternating perspectives or the house's narration. That's one of the reasons I fell in love with this book. Everyone certainly does have those, Reno! We weren't on the same page with this one, but different strokes for different folks. The writing was beautiful, but her plot wonkiness always drives me nuts. 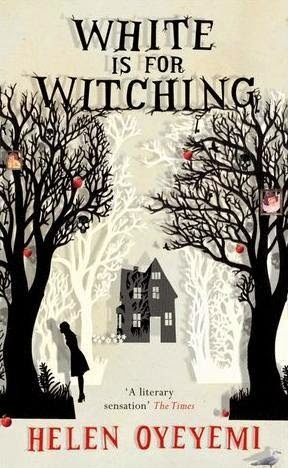 I heard such great things about White is for Witching that I pushed the book to the top of my to buy list, and then for some reason or another, I kept bypassing it to purchase one lower on the list again and again. Perhaps I subconsciously knew what I was doing. I think you had an inkling, my friend! Sorry to hear this didn't really do it for you. I haven't read anything by Oyeyemi, and thanks to your reviews, I don't feel like I've really missed out on much. Eh. She tries, but for me her stuff just isn't successful. That totally sums up Oyeyemi for me, too. LOL, I hope it works better for you, Wesley. I'm getting a Victor LaValle vibe from you. Is this as weird as the Bloody Buffalo? Eh, this probably isn't for me. I think I'll pass. That's a lot of weirdness in one book and while sometimes that works it doesn't sound like it does in this case. Hahaha, Heather's comment! Oh, Devil in Silver... I have this one on my shelf but just never pick it up because it gets such mixed reviews. I should maybe just try it and see what happens. Sounds like there is a lot going on in this book. Too much for me to wrap my brain around. Sad. I'm ordinarily impatient with books that don't explain themselves adequately, but I loooooove Helen Oyeyemi. There's something about her writing that just clicks with me every time, even when I have broader problems with her books. But, oh well. Not every author is for every reader. Oh man, it totally sounds like it would have everything working for it (and that cover is to die for)...sorry it didn't work out! I'm still really curious about Helen Oyeyemi and hope to get to Boy Snow Bird at some point. Ahhhh . . . I was waiting to hear what you thought of this one. It seems like it could be so good! But since Boy Snow Bird was rough for me as well . . . I think I'll pass on reading more Oyeyemi. For now. This sounds interesting, but I've read a number of reviews where people felt let down by Oyeyemi's work, so I'll probably pass on them myself. I'm intrigued by the fact that the house has a perspective though!